I could have posted a picture of myself standing on the top of Snowdon (1085m) this afternoon, grinning cheesily as if I had actually walked up there under my own steam, but I think this photo is much nicer. It's a ptarmigan. Or a partridge. Possibly a grouse. * Anyway, it was on the top too. The steam I actually got to the summit under was courtesy of the Snowdon Mountain Railway, just one of a bunch of little railways to be found in Wales, this one purely a pleasure ride built in 1896 by the Victorians, who enjoyed an engineering challenge. "Ooh look," they said, "here's the highest peak in England and Wales: what shall we do with this feat of nature, raw and magnificent? Let's build a railway up it!" It's a rack and pinion railway, the only one in Britain, and the only way to cope with the 1 in 5 gradient near the top. We had a perfect view of the track, and the insoucient sheep grazing on it until the guard set about them with whistle and hooter, as we were travelling in his compartment at the front of the carriage, thanks to VisitWales's letter of introduction. The path to the top was often clearly visible from the train, and was busy with walkers enjoying what one young man described up at the cairn as 'a decent walk' - it certainly looked very civilised, wide and gravelled all the way. His phobic girlfriend was clinging to the cairn and carefully not noticing the spectacular views: it was a peculiar choice of activity for someone who doesn't like heights, I couldn't help thinking. Even higher were a couple of jets screaming around the sky having fun in the name of training. Someone told me they were from the airfield in Anglesey. Wanting, in best reporter tradition, to get my facts right, I asked her what the planes were. "British," she said. 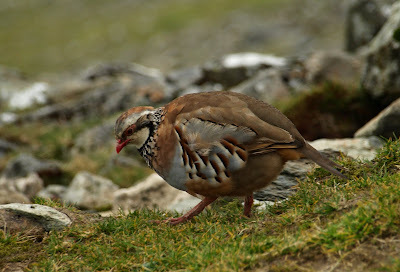 *Red-legged partridge. You really wanted to know that, I can tell, so I looked it up.